I can choose an application and create a product that teaches other students about cyberbullying. I can collaborate with other group members to complete a project. 1b Create original works as a means of personal or group expression. 2a Interact, collaborate, and publish with peers, experts, or others employing a variety of digital environments and media. 2b Communicate information and ideas effectively to multiple audiences using a variety of media and formats. 2d Contribute to project teams to produce original works or solve problems. 5a Advocate and practice safe, legal and responsible use of information and technology. 5b Exhibit a positive attitude towards using technology that supports collaboration, learning, and productivity. 5d Exhibit leadership for digital citizenship. 6a. Select and use applications effectively and productively. You will work in a group of two or three students to complete this project. Choose one of the options below to teach students at our school about cyberbullying. 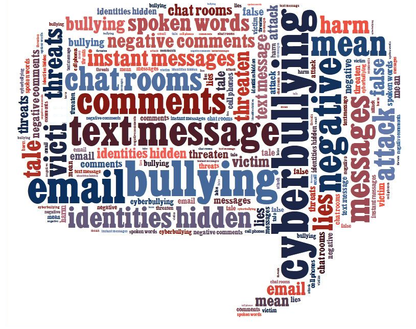 Include information from your research on cyberbullying. Projects will be posted on our class website for other students and parents to see. Option 1: Create a poster. Option 2: Create a comic strip. Option 3: Create a cartoon video. Each student should complete the Project Exit Ticket upon completion of the project. (2014). What's Cyberbullying? (3-5) | Common Sense Media. Retrieved March 26, 2015, from https://www.commonsensemedia.org/educators/lesson/whats-cyberbullying-3-5. (2011). The Power of Words (3-5) | Common Sense Media. Retrieved March 26, 2015, from https://www.commonsensemedia.org/educators/lesson/power-words-4-5.